Winter is over, so you may have thought wreath season is also over. 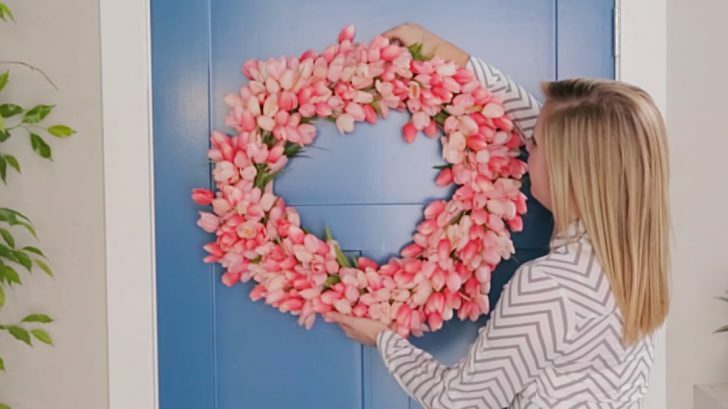 Believe it or not, spring time is a perfect excuse for hanging a wreath: just make it bright and floral! This tulip wreath is a great decoration for spring, and with Easter coming up, it’s a great holiday decoration too. Wanna make it yourself? Simple! First, you’ll need to gather your supplies. To get started, wrap your ribbon around your wreath form. Secure it with hot glue and keep wrapping until it covers a section about as long as the tulip stems. Trim the tulip stems to size, then lay it on top of the ribbon. Secure with hot glue, then wrap the ends with ribbon. Layer on the next bunch of tulips and repeat the process. Layer the flowers so there are no gaps, and continue along with the process. Slide the last bunch under the first and secure with more hot glue. Trim the ribbon and secure the end with hot glue. To make the hanger, loop some florists wire, cut a small hole in the ribbon of the back of the wreath. Twist to secure the loop in place. Hang the wreath wherever you’d like it, and you’re done! For more tips and tricks, watch Better Homes and Gardens‘ video down below. Better yet, read their post about this gorgeous wreath by clicking here! Have fun making it and happy spring!